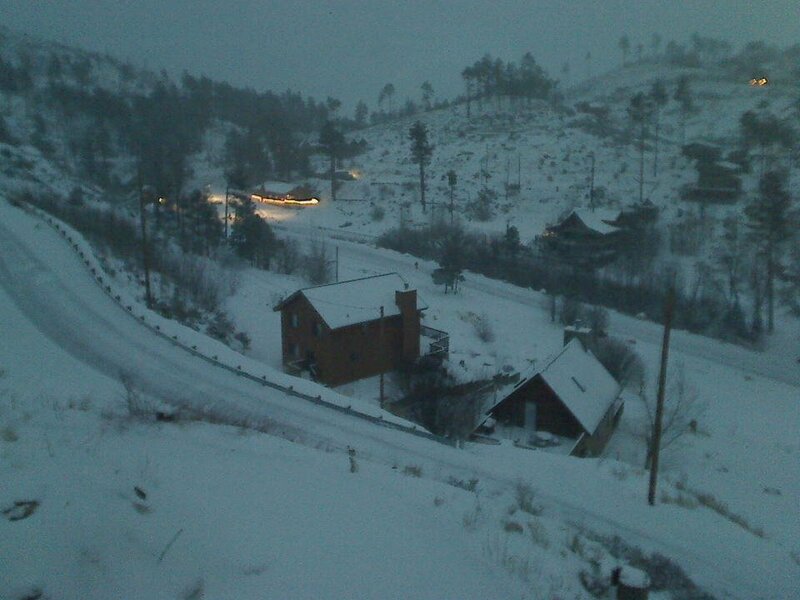 Art Douglas reports 5 to 6 inches of snow on the ground this morning at his place in Ash Canyon (south of Sierra Vista). Photos are of yard (above) and of his new house from a distance (below). Showers began here at the house about 5:30 pm yesterday (Sunday, December 30th) and this morning 0.42" had fallen at house. 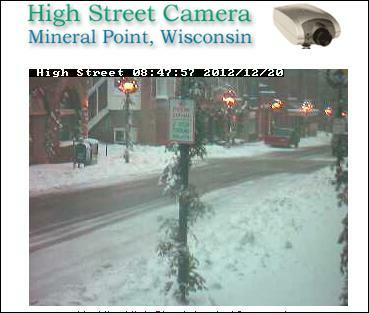 Better than I had expected (web cam above shows what appears to be a fairly light snowfall on Mt. Lemmon), and light rain continues. 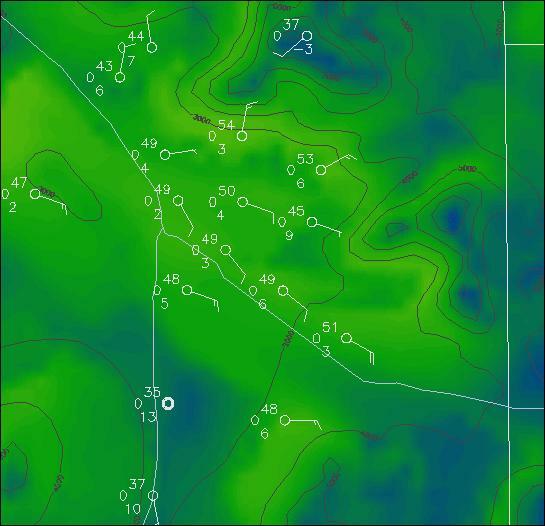 It is hard to know quantitative details on precipitation across eastern Pima County, since many gauges experienced both rain and snow. Coverage was essentially 100%. Low here at house was 38F and rain was not close to mixing with snow. Morning sounding at NWS Tucson failed, so there is no hard information on local thickness. The NAM analyzes 534 dm but subjective analysis indicates that this may be too low (my estimate was 536 to 538 dm). Regardless the snow level did not come down as low as some model forecasts indicated. The NWS winter weather advisory (below) from yesterday was quite good, indicating snow level would stay at or above 3500 ft MSL. 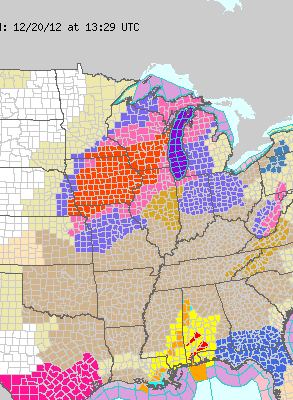 I also note that this advisory painted the exact area affected by the advisory, which is good. Happy New Year to all - more next year! This morning the 500 mb trough stretches from Montana deep into the subtropics west of Baja. The 12 UTC NAM analysis (above) indicates several vorticity maxima within the trough. The one over northern California will serve to broaden the base of the trough and slow it down just a bit. The NAM 24-hour forecast predicts the primary vorticity center to be located between Tucson and Yuma at 12 UTC tomorrow morning. The NCAR RAL 250 mb analysis for 12 UTC this morning is shown below. Upper-level winds appear to be strongest to our east and this would typically result in the trough moving quickly by. However, the jet west of the trough is centered somewhere just off the west coast, so it's character is not quite well-defined. The Atmo WRF-GFS model apparently ran at midnight last night. 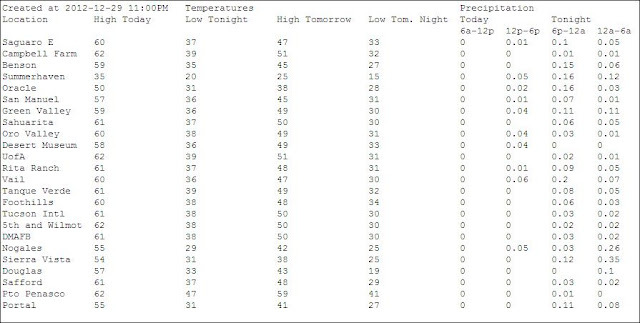 However, I can only find the tabular forecast for southeast Arizona - above. Note that the WRF-GFS forecasts a fairly light precipitation event, with forecast to have the most precipitation at 0.47". It appears that this system is not pulling subtropical moisture into the Southwest, as the models had tried to do earlier in the week. The NAM model now forecasts thicknesses over or near Tucson tomorrow morning down to 534 dm - meaning the snow level will likely drop into at least parts of the metro area late tonight/early tomorrow. Assuming of course that the model has accurate forecast. Some roads and bridges in eastern Pima County could be slick at sunrise tomorrow. Caution advised. 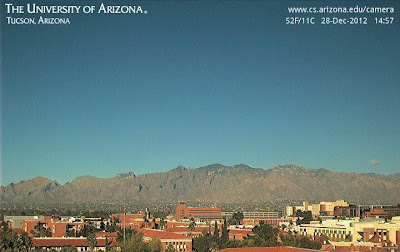 It is a picture perfect afternoon today (Friday, December 28th) in Tucson with bright, clear skies, as the Computer Science web cam shows above. Temperatures are in the 50s, after morning lows below freezing (26F here at the house). We continue to be in a pattern that is causing considerable uncertainty in the computer model forecasts - both short and long-term. The next storm was forecast to be somewhat warmer and perhaps with a subtropical moisture connection. However, the models are now indicating another cold storm event, and one with uncertain moisture influx from the southeast to southwest. The two ECMWF graphics above are valid at 72-hours (i.e., at 5 am MST Monday morning, the 31st) for 500 mb (top) and 850 mb (just above). The ECMWF forecasts a trough over the Southwest that has two embedded vorticity maxima at 500 mb - one over northern New Mexico and the other over southwestern Arizona. Moisture at 850 mb is fairly widespread in the ECMWF forecast and 1000-500 mb thickness values are below 540 dm, which means fairly low snow levels. 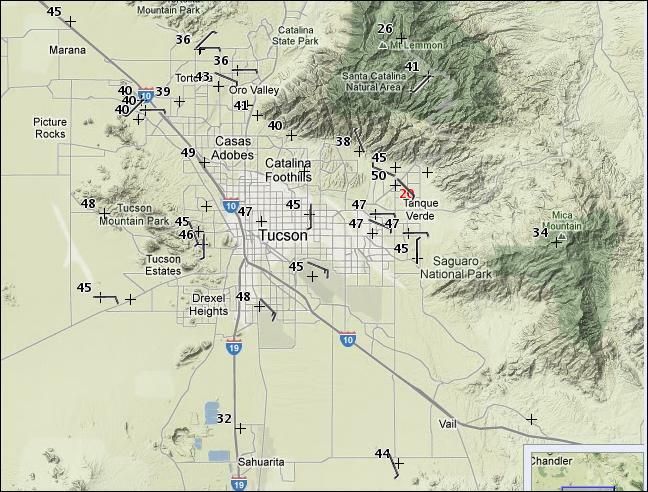 Thickness values of 534 or less usually mean snowfall into the Tucson metro area. Similar forecasts from the GFS are below, for comparison. The GFS forecast emphasizes the vorticity maximum over southwest Arizona. Both models forecast a trailing vorticity maxima that is advecting southeastward beneath the ridge over western Canada. This is a complex situation with subtle differences between the two models at 72-hours - one to monitor closely, given the model uncertainty. Note that GFS ensemble members forecast precipitation over southeast Arizona for the 12-hours ending Monday morning in 10 of 12 members - a fairly high probability for precipitation some time on the last day of the year. A band of convective showers (ahead of the short wave/vorticity maximum moving across southern Arizona) is moving across the Tucson metro area. Radar and view of Catalinas above are from around 4 pm MST. The showers produced a strong outflow and sharp temperature drop here at house - estimate brief gusts to 40 to 45 mph. The time series below (from Atmo) show the temperature drop and also indicate gusts to 70 mph on the roof of the Atmo building. Only a trace of rain here, but definitely a nasty end to the afternoon. Subtropical Moisture Plume For New Years? I've shown two panels from the 144-hour ECMWF operational model (valid time is 5 am MST on New Years Day). The model forecasts a 500 mb closed low (above) over northern Baja at this time. The 700 mb forecast valid the same time (below) indicates a broad plume of subtropical moisture from the south, as well as substantial moisture from the east, impacting Arizona. If accurate, this forecast indicates a wet start to the New Year for most of Arizona and New Mexico. There is considerable spread in the ensemble forecasts, however, a number of members are picking up a subtropical moisture plume. Will be interesting to watch how this situation evolves. 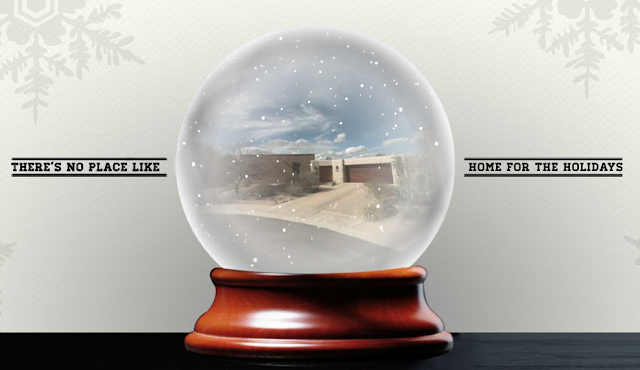 Christmas here in Tucson started out cool (low here at house 38F) and sunny. 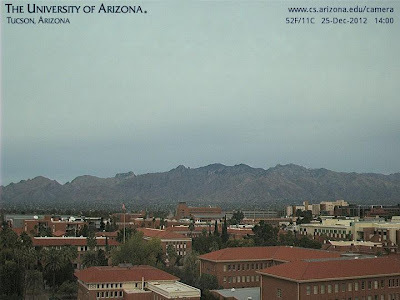 But by early afternoon the day had become very cloudy and dreary, as heavy, thick cirrus spread over southern Arizona from the Pacific - above image of campus and the Catalinas was at 2 pm. The 500 mb pattern was much like the mid-range forecasts highlighted in earlier posts. Strong, negatively-tilted short-wave trough digging into north Texas (12 UTC analysis above) was main weather maker for the day. 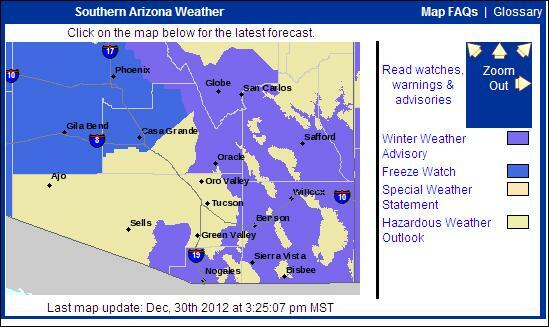 NWS watches and warnings for Christmas are shown below. Heavy snows from eastern Oklahoma into northern Arkansas occurred, with a severe thunderstorm outbreak over the lower Mississippi Valley (second graphic below). 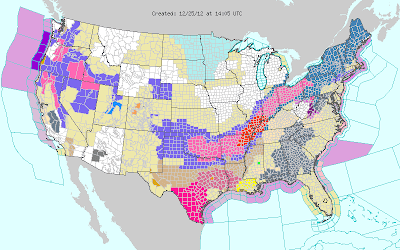 This morning (Wednesday the 26th) the storm is impacting the Ohio Valley and heading for the east coast. 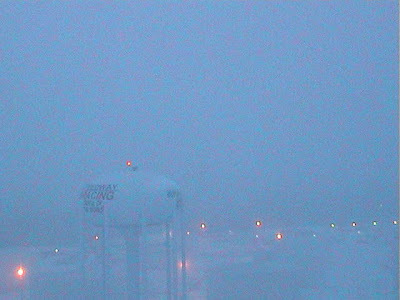 The web cam image below shows early morning conditions in Indianapolis, Indiana, which was reporting heavy snow and 30 mph winds at the time of the image (about 7 am CST). Unsettled weather continues over the West and I'll take a look at the forecasts a bit later. 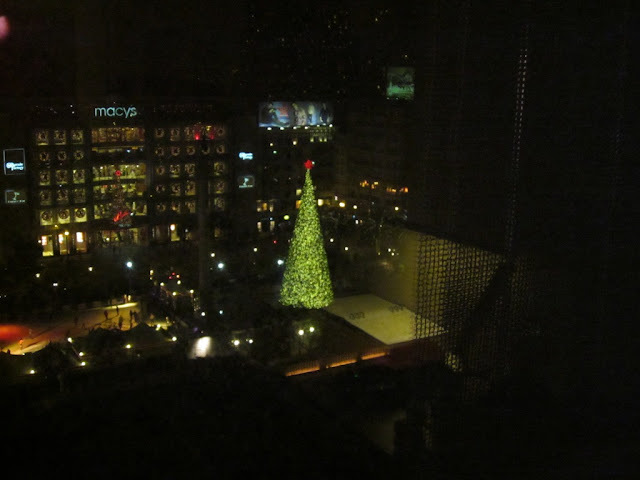 Photo is of Christmas tree in Union Square - taken on a quick trip to San Francisco earlier this month. 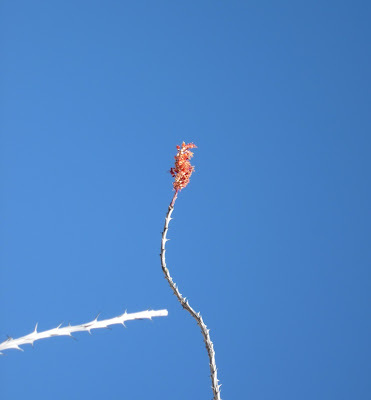 One ocotillo plant in the back yard fence (an ocotillo fence) is still holding a bloom, as Christmas approaches. A quick look at the outlooks for tomorrow - still have shopping to do! 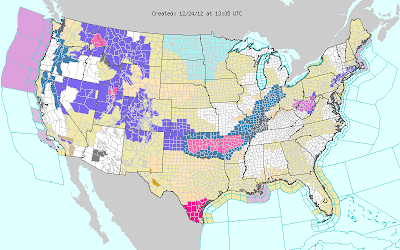 Above is the NWS watch/warning map for tomorrow - Christmas Day 2012. Wintry weather outlooked from the Northwest, across the Southern Plains, and into the Ohio Valley. The SPC has issued a severe thunderstorm outlook for tomorrow that includes an are of moderate risk (below). 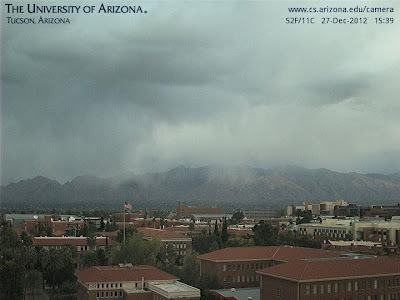 An active weather event will likely unfold as the last week of 2012 begins. 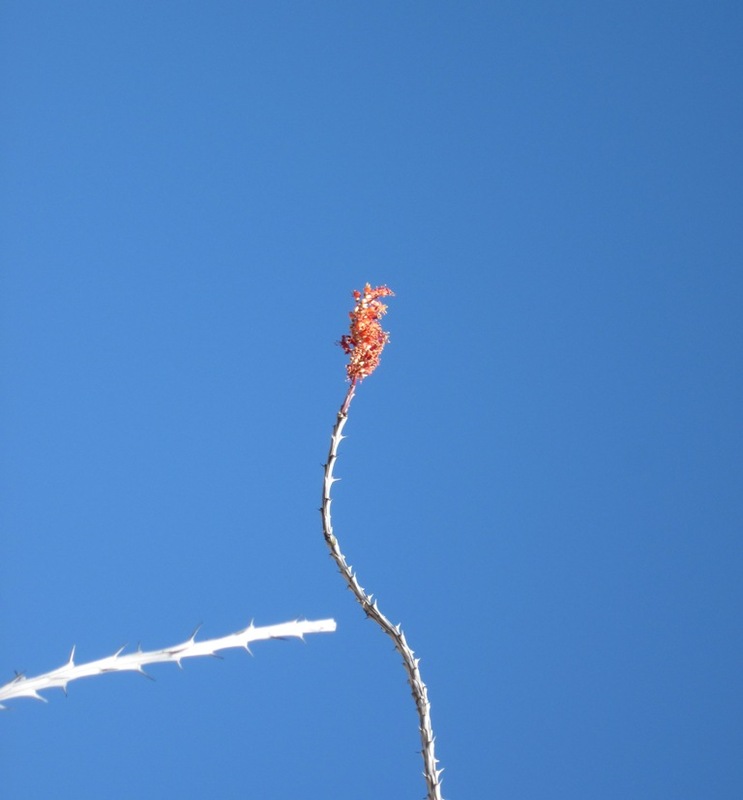 David Cristiani has shared some photos of sunrises over Albuquerque taken during December. These are from his house, which is in the eastern foothills just north of !-40 (I think). 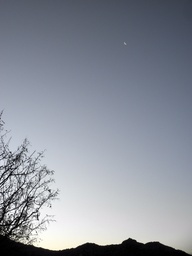 Note crescent moon in second image. Here are some of the possible storms forecast by the GFS ensembles and the ECMWF operational models from Christmas to New Years Eve. Looks like another serious winter storm from the Southern Plains on Christmas to the Northeast by the 27th. The ECMWF hits the Northeast with back-to-back storms on the 27th and 31st. Of course this is all at long-ranges and the forecasts are varying with each new run - so what's probably certain is that the last week of the year be quite interesting weather-wise. The WRF-GFS forecast for temperatures overnight (see earlier post -with a correction, since I had pasted-in the wrong graphic) was very accurate. 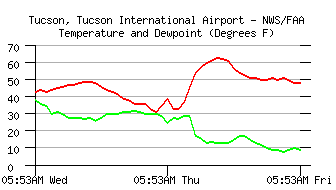 It was a much milder night, and the official forecast of a low of 33F for the airport was far off the mark - it appears that the actual low at TUS this morning will be 48F. Low here at house has been 38F (edited to add: It dropped down to 32F here at house right around sunrise) - so the Rillito cold continues to be a bit beyond the capabilities of Mike Leuthold's current version of the local WRF. The overnight T and Td traces for the airport (above) and Atmo (below) show the truncated diurnal curve that was caused by the gusty east winds continuing through the night. The winds at the rooftop anemometer on the Atmo building stayed strong and gusty (green trace shows gusts) after about 10 am yesterday morning, with a number of gusts above 30 mph. A significant miss with the nighttime temperatures can have important economic impacts - particularly if the local utilities planned electricity and gas needs during the night were seriously off. 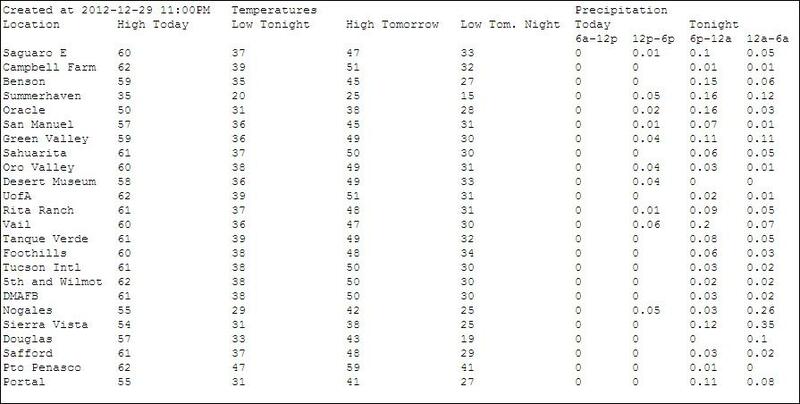 A number of years ago, when I was familiar with the daily operations at SRP in Phoenix, an error in the forecast max or min temperature of 3F or greater was considered a busted forecast, worthy of a postmortem look to determine what went wrong. The forecasts I refer to were made within SRP operations, not by the NWS. Finally, it appears that the last 10 days of 2012 will be characterized by stormy, winter weather over much of the country - will take a look at what's being predicted by the models for rest of december later today. The 12 UTC (20 December 2012) morning run of the WRF-GFS model at Atmo forecasts the current gusty east winds to continue through the night. The downslope winds keep things mixed, and temperatures at 6 am tomorrow morning are forecast to be quite mild - as per the plot above (note - I had inserted a graphic for a different time - the surface forecast above is now the correct WRF forecast for 6 am this morning). Current NWS forecast low temperature for TUS tomorrow morning is 33F - very different than the WRF forecast low for TUS of 47F. Will watch to see how the winds modulate temperatures during the night. First, a quick report on morning lows here in Tucson area - low at house was 25F. However, both my max/min thermometers were coated in ice at sunrise - so I'm not sure if readings were accurate. There was a moderate to heavy occurrence of frost here in the north part of the city. The low at the airport was officially 31F. The temperature here at the house was the same as the low on November 12th, with both days dropping to 25F. The GFS ensemble member forecasts for Christmas are now fairly consistent. The operational GFS 500 mb forecast valid 12 UTC 25 December 2012 is shown above, A short wave is digging some toward the Southern Plains and lower Mississippi Valley, with a weaker wave over the Great Lakes. The operational ECMWF forecast for the same time (below) is quite similar. At the surface both forecast models are similar (GFS above and ECMWF below), with the main feature being a large, arctic high sliding south over most of the northern 2/3rds of the country. Cold and snow forecast for the upslope flow with this high and over the Great Lakes and rain and thunderstorms for the Gulf Coast. The ECMWF has forecast a more significant surface system over the eastern Great Lakes. Will check back on Christmas to see how the five day forecasts verified. 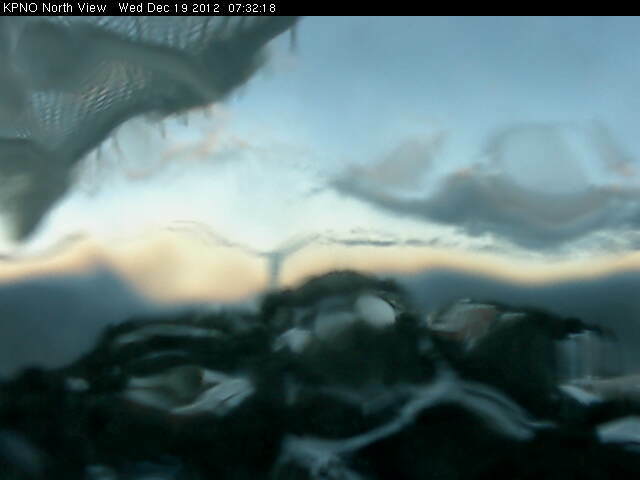 The surreal view above is from the Kitt Peak north-looking web cam at about 7:30 am MST this morning. The overnight event iced up the camera. 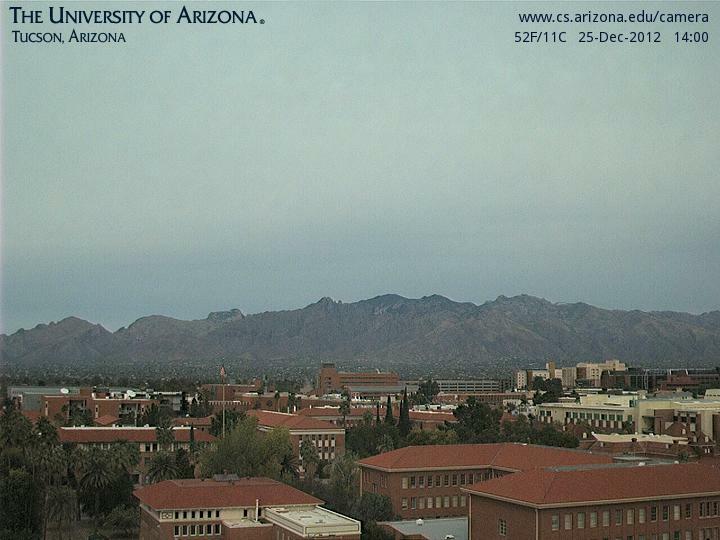 Skies are now partly cloudy as the weather system heads on to the east and northeast. Across the ALERT network about 100% of the stations had precipitation during the night, with amounts mostly in range 1/10 to 3/10 inch. Here at house we had 0.12". 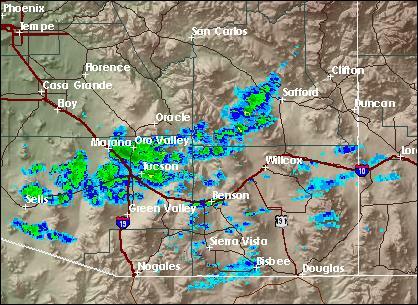 Heaviest amounts were in the Catalinas and Rincons. Five sites had over half an inch and Manning Camp is reporting 0.87" this morning - may be suspect since much of precipitation up there should have been snow. As the system moved through wind gusts to around 30 mph were common. Highest gusts I saw were 57 mph at the Guthrie RAWS site and 65 mph on the roof at Atmo.